MUMBAI: For India Inc, 39-year-old environment lawyer Ritwick Dutta is a perennial nuisance, someone who has been obstructing, slowing and litigating against the industrialisation of the country. But for tree huggers, he’s Captain Planet trying to save the earth from mindless destruction.Dutta, a Supreme Court lawyer for more than a decade, has blocked big projects like bauxite mining by Vedanta Resources and Posco‘s steel project in Odisha. He fought 350 cases against behemoths lik Posco, Vedanta, Jindal SteelBSE 5.67 %, and government-backed NTPCBSE 0.99 % in the past 10 years, making him unpopular with Corporate India. He fought his first case at the age of 28 against Vedanta, representing the Dongria Kondh tribals of Niyamgiri, who wanted to stop the London-listed giant from mining bauxite. Dutta fought the case all the way to the Supreme Court, which then asked Vedanta to get approval from the tribals to start mining. The tribals rejected the request, and the hills remain untouched. “Virtually 330 acres of forest land is diverted every day in India, according to the ministry of environment,” says Dutt .. The cases that come for legal challenge are less than 1% of the approved (projects).” Dutta, along with another environment lawyer Rahul Choudhary, founded the Legal Initiative for Forest and Environment (LIFE) in 2005.Local communities, farmers, horticulturists, who fear loss of business and sustenance, make up 90% of their clients. Dutta fights about 30-40% cases for free while for the rest he gets paid sometimes in cash, sometimes in vegetables, fruits and hand-woven clothes. 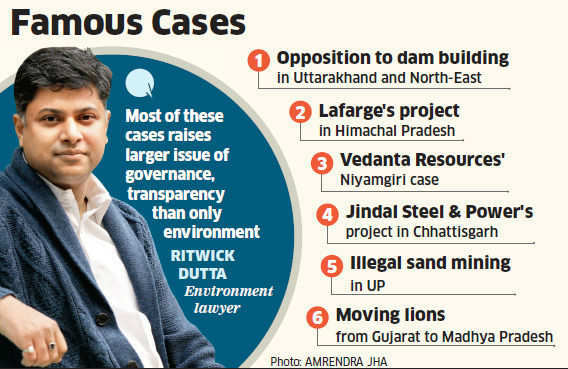 Today, 65-70% of lawsuits result in at least some outcome in terms of more scrutiny through public hearings or having to re-apply for environment clearance, says Dutta. Even corporate lawyers, who have fought against him, call him honest, focussed and driven. He has raised important issues. No one earlier was bringing up these issues so consistently,” says Prashanto Chandra Sen, who represented a leading mining firm against Dutta. However, there is a concern about his overwhelming activism. “He is a good lawyer as far as environment is concerned. He is a mix of activism and law. He should see both sides of the issue,” said Supreme Court lawyer ADN Rao, who too has fought against Dutta. Dutta, a graduate in sociology and law, never intended to become an environment lawyer. His interest lay in environment activism and conservation.But he realised that there were few full-time environment lawyers ready to fight on behalf of communities. “Frankly I don’t think I have the capacity to study anything else which is non-environmental.would have turned into a very fluff corporate lawyer. It is not a sacrifice,” says Dutta.